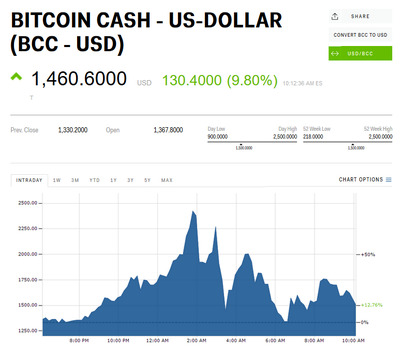 Bitcoin cash reached an all-time high of $US2,500 a coin early Sunday morning, surpassing Ethereum as the second largest cryptocurrency on the market. The coin was trading up 14.7% at $US1,525 by 11:35 AM ET. The cryptocurrency skyrocketed to an all-time high of $US2,500 a coin early Sunday morning. It also surpassed Ethereum as the second largest cryptocurrency by market cap, according to CoinMarketCap.com. Bitcoin cash, which notably split from the original bitcoin in August, was gaining on its sister coin up until around 2 a.m. ET. It later shed about $US1,000 and by 11:35 a.m ET was only trading up 14.7% at $US1,525, slipping back below Ethereum’s market cap. Still, it was an impressive march for a coin which has spent most of its existence trading between $US300 and $US500. Ethereum founder Vitalik Buterin even chimed in on the news in a tweet late Saturday night to congratulate the coin’s main backers. Bitcoin cash’s rise appears to have come at the expense of bitcoin, which dropped to a low of $US5,512 per coin over night. It hit a record high of $US7,828 on Wednesday. By 12 p.m. ET, bitcoin was back up at $US6,160. Bitcoin has been sliding since developers behind a split, known as Segwit2X, revoked their support for the plan on Wednesday. Cryptocurrency experts told Business Insider that backers of Segwit2X are likely dumping their bitcoin and jumping on the bitcoin cash bandwagon. Both Segwit2X and bitcoin cash were conceived with the same intention to help bitcoin scale faster by increasing the size of its blocks. “When you look at the trends, it does look like many Segwit2X supporters have switched to bitcoin cash,” Abhishek Pitto, CEO of Nucleus Vision, told Business Insider. Kyle Samani, a managing partner of MultiCoin Capital told cryptowatcher Laura Shin a number of bitcoin whales, wealthy bitcoin traders, are moving over from bitcoin to bitcoin cash. Samson Mow, chief strategy officer at Blockstream and bitcoin evangelist, told Business Insider bitcoin cash’s price pump will be short lived.